But I have to pass on a delicious recipe before the apple season finishes. You might want to give it a bash - the wetter Cape weather and sport-based gatherings mean more home entertaining. This recipe is my version cobbled from the recipe for one large tart in Rick Stein’s French Odyssey, and Pete Goffe-Wood’s individual tatins in his Kitchen Cowboys cookbook. A lovely collective gift from long-time friends was the inspiration: my Le Creuset cast iron 30cm skillet pan goes from the stovetop into the oven. 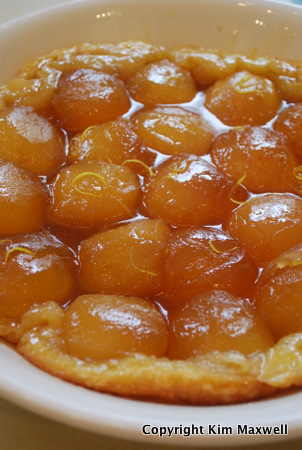 Stein says you can use a tarte tatin dish but I’m not convinced you’ll get the same results. Anyway it’s delicious and oozily gooey - so worth the effort to make! Roll out the pastry on a lightly floured surface without handling it much. 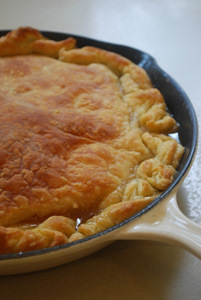 Cut a rough circle a little larger than your skillet pan and transfer the pastry carefully to a large baking sheet. Chill for minimum 20 minutes. Make the apple filling by peeling, coring and halving each apple. Sprinkle the diced butter evenly over the skillet surface. 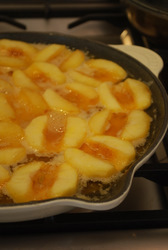 Pour the castor sugar over and then pack the apples tightly on top, rounded side down. Heat the skillet to medium (use a wide, even flame if using gas) and cook the apple and sugar mixture for 20 – 25 minutes, shaking the pan occasionally until the sugar and butter mix with the juices to produce a thickish, toffee-toned sauce. The apples should be tender but not falling apart. Don’t allow the butter and sugar to burn in the process. In an oven preheated to 200 degrees C, lift the pastry carefully over the cooked apples. Tuck the edges inside the pan. Prick a few times with a sharp knife. Bake for 5 minutes then reduce the heat to 190 degrees C for 15 – 20 minutes until the pastry is puffed, crisp and golden. Use a baking tray on a lower shelf to catch any sugar spillage. Remove the skillet from the oven and rest for 5 minutes. Grab a strong man and ask him to invert the pastry into a large round serving bowl. Garnish with lemon zest and serve slices with vanilla ice cream. TIP: I’ve previously used Granny Smith apples for tartness, but remembered pastry chef Vanessa Quellac telling me that pink apples tend to make firmer baking partners so I gave them a whirl. Very happy with the pink results.